making home | Hi, I'm Danica. 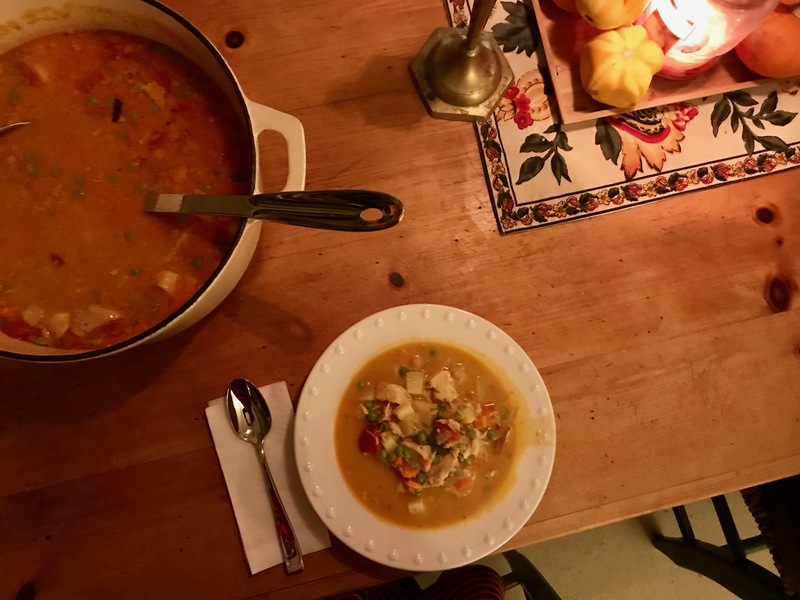 Mulligatawny Soup — a comforting favorite! Did you know that “homemaker” isn’t just a placeholder on an application for people whose lives are so lame they don’t leave home? It actually is an occupation — and more, it’s a calling. Homes, in fact, don’t just happen; they are made, and someone has to do that making. It is a gender specific calling for the wise woman who will give herself to the task. It is a calling that fosters the building of people, of families, and of culture. It is way more than a placeholder. This atmosphere that we’re called to cultivate (first in our own souls, and then by extension in our domain) will look unique in each home. Isn’t that beautiful? I love the many expressions of God’s Kingdom that erupt in the earth as homes are established to His glory. Because I am the homemaker here, our signs of “home culture” may look a lot like reading aloud together, listening to classical music in the morning and classic jazz in the evening, ethnic food and Dutch oven meals, flowers in the summer and candles in the winter, and pretty things here and there. That’s me. But I remember a friend’s home from my childhood, a place of incredible joy and warmth and togetherness — full of mountains of mismatched tupperware dishes that we took turns washing our way through (because there was always, always at least one visitor), loud laughing and boisterous play, and an evening of fun looked like making candy and pulling the sticky ropes halfway across the kitchen in our buttered hands. I don’t remember a single candle or any bouquets, but I remember knowing that my friend wanted to be home with her family more than anywhere else in the world. The expressions will differ, but the mandate remains the same for women throughout time and the world over: to build a place where people find the flavor of heaven, and where souls are ministered to through their physical needs. Our five senses absorb life, and as homemakers, we touch hearts through the sounds and scents and scenes and food (don’t forget the food!) we provide. Some things won’t differ. All of the above things, in and of themselves, are so empty. Even Miles Davis is a clanging cymbal if there isn’t love, I guess you could say. First and foremost, there is Jesus. He has a culture that doesn’t bend, no matter where or when it’s being expressed. The Kingdom of Heaven is righteousness, peace, and joy. Our homes need to be places where right living is upheld and repentance is a well-learned skill; where peaceful living and peaceable living mean turning from worry and stress, and saying a hard NO to strife in our relationships; and where joy is sought and cultivated. Those things aren’t natural for any of us, but they are for the Holy Spirit, and He has come to make His home in us. We don’t have to settle for less, although those things will be a lifelong pursuit. We establish those gospel things as non-negotiables, but then we allow the talents, giftings, and tastes of ourselves (and our husbands) to shape the form it all takes. It’s a worthwhile task. Nations are shaped right here in our kitchens. The Little Book of Hygge — a totally secular book, but with lots of practical ideas for how to cultivate a sense of being present, and making home a place of enjoyment. The Hidden Art of Homemaking — a classic that I just love. She touches on every aspect of home, the biblical importance of what we do, and lots of practical ideas for how to do it. The Life Giving Home — if the previous title is a bit dated for your taste, this book says many of the same things in a more updated setting. The Little House books — because honestly, Ma is my hero. She makes home and hygge in a dugout on the side of a hill. Ladies, we can do this!